Welcome to our new look site! 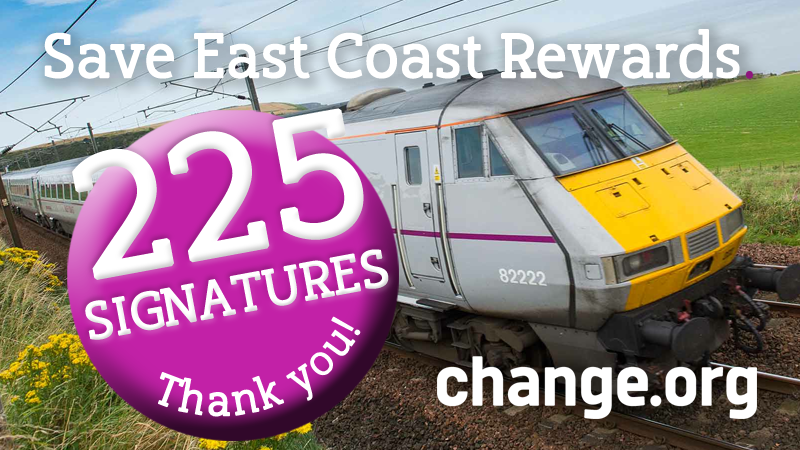 This week as well as a new site we also launched our first petition We're doing that to make it clear to Virgin Trains East Coast management as well as the press and other rail operators the level of feeling regarding East Coast Rewards. We ask that you sign our petition and share if with any of your friends, family or colleagues that are regular rail users. Even if they weren't East Coast Rewards members in the past show them what advantages the scheme offered if they support our campaign to bring the scheme back it will benefit them as well if we succeed. We reached 225 (a significant number for the East Coast) signatures for the petition in under 48 hours. Now it's up to you to spread the word and get everyone you know to sign it. Don't forget our Rewards Guide section contains all you need to know to compare East Coast Rewards with Nectar.